Discover The Remedies Used To Treat Sickness & Disease That Many Owners Don't Want You To Know About! Congratulations! You have just found one of the most important pages you will ever come across on the internet with regards to chinchilla home remedies! This page is important as it holds information on the hidden remedies you can easily find in your home or locally, to help cure many chinchilla illnesses and sickness sooner! The true fact is...there are alternative ways to cure and prevent some diseases sometimes even eradicate them altogether and that is where this informative booklet will help you. This booklet will help you discover what alternative remedies you can offer a chinchilla that are safe on their sensitive digestive tract and what medications to avoid that can actually kill your beloved pet! Just imagine what it will be like if your chinchilla is gravely ill and you had something within your household that could of helped save them before it became too late! This is where Home Remedies & Safe Medications for Chinchillas will help you! Home Remedies and Safe Medications for Chinchillas is jam-packed full of information on over 40 different products that are safe for chinchillas. Written by an experienced 'published' chinchilla author, this informative booklet has been self-published to compile all the chinchilla knowledge and experience the author has acquired over her many years in chinchilla care. It is unfortunate but when a chinchilla becomes ill they rapidly deteriorate! Some owners think they can go on the internet and find a quick solution to the problem but this simply is untrue! The internet is a great place for research but webpages can be written by inexperienced people, hold inaccurate information or misguide owners on treatment methods. Many hours are spent searching for relevant information when it should first be asked - How accurate is the information and how much experience and years of knowledge does the owner of the website have? Then you must seriously ask yourself...Would you like to risk your chinchilla's health on advise from an unknown source? Surely not! 'Home Remedies & Safe Medications For Chinchillas' is a 'must-have' booklet for any chinchilla owner and written by a published author with years of chinchilla knowledge and experience! Published chinchilla author, Mirella Poli has compiled her years of knowledge and experience just for you! This self published booklet provides the reader 'peace of mind' to its credibility and will save you hours trying to find information on the internet when time should be spent trying to save your pet! Why Is This Booklet So Cheap? At £3.50 this great booklet is so cheap its unbelievable and the cost has been kept low just for you! By self-publishing the author has saved £££'s on the large publishing companies, which can be passed on to you literally saving you £££'s !!! Don't Miss Out On What The Author Already Knows! Surely you owe it to your pet to grab this valuable information and protect your chinchilla from unnecessary treatment or misinformation, which can cause them further harm or distress? DID YOU KNOW MANY MEDICATIONS AND PRODUCTS CAN ACTUALLY BE KILLING YOUR CHINCHILLA? 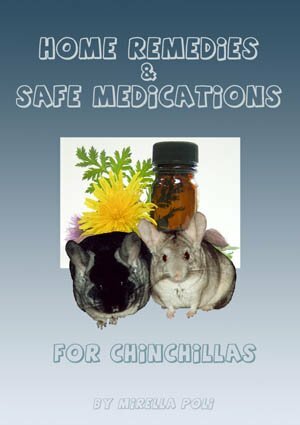 Home Remedies & Safe Medications for Chinchillas is exactly that...a compilation of various remedies and medications all put together in one 'easy-to-read' booklet. The author has spent many hours researching the topic of home remedies for chinchillas, together with the products and veterinary manuals/guidance and has compiled all the information into a booklet just for you. Save yourself hours of surfing the internet (only for your time to be wasted) when the information you are looking for can be right here in one quick read! Home Remedies & Safe Medications for Chinchillas is so cheap for the invaluable information it holds, every chinchilla owner should read and know about it! Do Your Chinchilla A Kind Favor And Read Home Remedies & Safe Medications For Chinchillas! * This booklet is not to replace qualified exotic veterinary advice. We always recommend when a chinchilla is sick, you take them to a qualified veterinary surgeon immediately as their health will deteriorate rapidly!